Hello! I’m so pleased to be able to contribute to the SJL Blog! I am currently an urban public librarian in the Northeastern U.S. I spent much of my career in New York City where I went from public to nonprofit to corporate, with a brief stint in academic librarianship somewhere in between. From this varied background, as well as an increasingly alarmed and rebellious worldview, I have come to the conclusion that committed librarians (and everyone else for that matter) can and should help reinvent and improve society. This especially applies to groups and individuals who have been and may continue to be discriminated against and/or who lack resources and educational opportunities. I have served on the executive board of my labor union, recently joined Twitter (@BfloLibrarian) and frequently contribute to forums that advocate for libraries, librarians. I am also a runner, the mother of two lively girls, and the leader of a post-punk indie band. At first glance I thought writing about how the idea of social justice relates to librarianship would be pretty obvious and uncontroversial. As a librarian working in the main branch of a sizeable urban public library I daily come into contact with all kinds of people and strive to connect them with whatever they are seeking. When I do community outreach I explain how the library is theirs and should be able to help them throughout their lives. Sharing resources equitably underscores the idea of social justice and what the public library is or should be about, right? Well, maybe the connection isn’t so obvious. In my over 25 years of library work in the northeastern U.S., I have rarely heard explicit discussions about the role of libraries and librarians and how we might improve peoples’ lives through a social justice orientation. Either we take it for granted, don’t really get it, think it’s the role of civil rights lawyers and/or social workers, or, as my 7 year old daughter likes to say, “whatevs.” Maybe it is just too scary because it might be considered political or partisan. We wouldn’t want to be controversial now, would we? I took part in a webinar on the “hot” topic of innovation in libraries and I suggested that we think of innovation in terms of how to apply it to social justice work. I was surprised that several people asked what I meant by that. Even within the world of public libraries, the so-called “people’s universities,” it’s been unusual to hear fellow librarians discuss how we might be involved with issues of inequality other than by providing access to computers, books and entertaining programs. When I’ve broached the topic I often get a blank expression or a jokey comment about what a radical I am. Maybe it is too controversial for most of us, at least here in the U.S. I searched ”social justice” on Twitter and about a third of the tweets equate the term with stealing from “successful” taxpayers. Even more starkly, it’s associated with envy, since those holding this opinion invert social justice’s goal of ameliorating suffering and promoting equity with fear, greed and covetousness. The basic sentiment being, “don’t let those undeserving (often black or brown) poor take my hard earned cash.” So, yes, it becomes a polarized, bastardized term, rather than something equated with altruism and cooperation, behaviors that have allowed us to evolve as a species as opposed to greed and excessive accumulation, which only holds us back as a society. Bastardization aside, let’s reiterate how we might define social justice within the context of librarianship. “…embracing equality and diversity; focusing on a needs-based service and targeting resources towards those who need them most; knowing and understanding the components of the local community; having an active, collaborative role in empathising and working in partnership with the local community; and fully engaging the community, moving as far as possible towards co-production of service provision. Because libraries and librarians are tasked to serve all communities, we are inherently involved with and must be aware of issues of social justice. Ideals near to the heart of social justice advocates are egalitarianism, balance of power, social advocacy, public service, and diversity awareness. If we are to take these statements seriously, isn’t social justice integral to being a librarian, especially for those of us working in communities with poor disenfranchised populations? I would argue that it is integral, and that librarians that do not understand or acknowledge this are not doing their jobs fully. Sadly, it seems that many of us believe that the existence of the institution of the public library itself is enough, that its mere being constitutes equity, regardless of whether or not our services truly bear this out. We librarians just work there and do not necessarily play an active role in promoting and embracing these apparently controversial values, especially if our library leadership shies away from prioritizing them. So, I ask, how do we resolve what appears to be a contradiction at the heart of our profession? If we accept that the tenets of social justice are part and parcel of librarianship, we ought to find a way to carry this out in our work on a daily basis. Even if “The Library,” our leadership, avoids addressing equity in any profound way, we can and should still find a way to do it ourselves if we are public librarians with integrity. It’s an essential way to make lives and our work valuable, internally and externally, especially in a time of increasing economic disparity and continued need. Imagine if more of us embraced these principles and acted on these values, how much better our libraries, communities and the world might be. 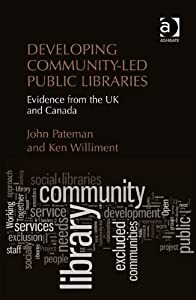 John Pateman – previously from the UK and the new CEO at Thunder Bay Public Library in Ontario – and I have spent ~ the last two years writing this book (Click Here). It will be release in both Europe and North America in late February. Ashgate UK has been kind enough to provide the first chapter available at the bottom of the page for free viewing. This has lead to a reduced number of postings on the blog… So hopefully myself and other co-contributors to the blog will be able to ramp up again soon. Anyone interest in writing on the blog can also contact me.